Footner is a revolutionary new way of combating hard, dry skin on the feet and they have come up with some exfoliating socks to leave your skin feeling baby soft. My feet have really suffered over the last couple of years since having children. 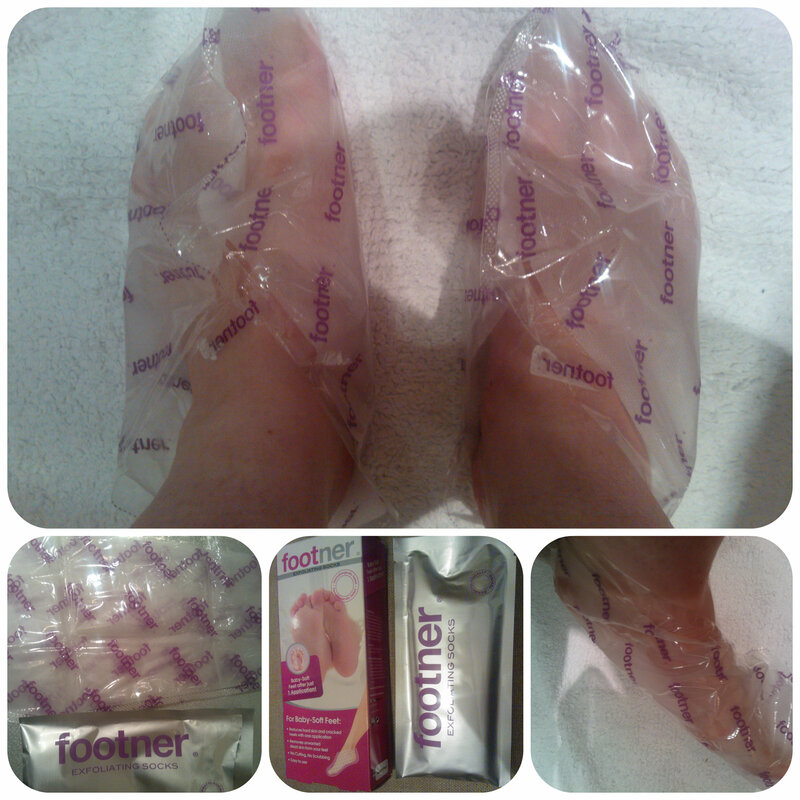 I have given them minimum attention and worn flip flops regularly over the last few summers which has led to dry skin and painful cracked heels that are hard to get rid of so I was eager to try Footner and see if it lived up to it’s claims. The socks come in a sealed packet which you cut open just before use then sit with your feet in them for 1 hour. This allows the solution within the sock to soak into the feet. It is suggested to soak your feet before applying them which I did. When I took them off, my feet felt a little softer due to the moisture that they had been soaking in, but then you have to wait for approximately five days for the magic to happen! I checked my feet eagerly over the next few days and actually wondered if anything would happen, then I noticed the skin starting to dry up slightly, before a few small areas starting to peel. Thinking that would be it, I woke up in disbelief a couple of days later to find skin literally dropping off my feet!! This was the most unpleasant few days of the treatment as I had to cut away large pieces of skin and empty my socks after a day at work! Once I’d shed what seemed like an incredible amount of skin, I was soon able to see the new skin on my feet. So was it worth it?? Well I did ashamedly have some deep cracks on my heels and Footner does say that it may not be able to remove very hard skin and this may need a further application, leaving at least 3 weeks between treatments. I can still see my deepest cracks although they have now come lot nearer to the surface which is good but overall my feet do feel softer and have lost that dull, lifeless look they had before. I am going to try a second treatment in a few weeks in a bid to get my feet summer ready. They feel softer and less dry and definitely have baby soft feel in areas that were only slightly dry beforehand. Being a home treatment, you can use Footner when you want and it requires minimum effort and no wasted time going to a salon or being sat at home filing your own feet. Ideal for me, being at home with two children and never getting a minute to myself. I could just relax in the socks then wait the 10 days until the peel was over. I decided to get a second opinion and held my feet up for my husband to see, bearing in mind he had told me to keep my feet away from him over the last week due to the excessive peeling. His reaction was instant, with his eyes wide open, he said with an almost shocked expression “OMG, they are a hundred times better”. This entry was posted in Beauty Reviews, Reviews and tagged cracked heels, dry heels, dry skin, exfoliating, feet, feet hard, foot, foot care, footner, footner socks, hard skin, hardskin, socks by Fiona Martin. Bookmark the permalink. Not 100 times worse, but I can certainly see the difference! They look really good. When you warned me about this post I thought ‘it will be fine, it can’t be that bad.’ I was wrong. There are some things you can’t un-see. Still, they do look a million times better! I think I need to try Footner! Blimey! That’s quite amazing, but you can certainly see the difference. I’ve been blaming my age for the fact my feet are so much drier these days, but perhaps its just motherhood and no time for pampering! OMG! That is AMAZING! I need it! Fab review! Eileen Teo recently posted…What is your mealtime conversation starters with your kids? Ew you could have warned me about those photos! It really does look like it has worked well. I could definitely use this for my feet, they are terrible!